And the winner of Worst Gadget of CES 2009 goes to My Email Buddy. This device connects to your computer via USB and notifies you with lights, sounds, and a spinning postman when new email arrives. 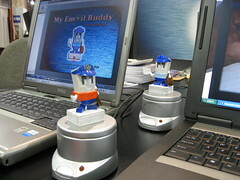 You can configure My Email Buddy for one or several email accounts. Why am I rating this worst gadget of CES09? Because it is probably the biggest productivity killer I've seen in a long time. All of the gurus who help people get focused on being more productive recommend turning off email notifications as one of the first steps to eliminating distraction in the workplace. My Email Buddy does the exact opposite, drawing massive attention to each new message. The only thing missing is something to drop confetti from the ceiling (maybe next year? ).